How’s a queen to keep her head in the middle of a revolution? This month, Clarksville’s oldest professional theatre is taking audiences from Versailles to the guillotine with a stylistic and satirical retelling of the life and final days of the most famous queen of France. 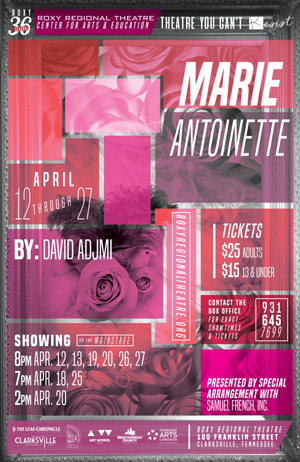 A contemporary twist on a historical tale, David Adjmi’s MARIE ANTOINETTE opens at the Roxy Regional Theatre on Friday, April 12, at 8:00pm. In keeping with the theatre’s traditional pay-what-you-can opening night, all tickets not pre-sold at the full price will go on sale at 7:30pm that evening for a $5 minimum donation. MARIE ANTOINETTE also features Ryan Bowie as her husband Louis XVI, Brian Best as her brother Joseph, Jeffrey Keller as love interest Axel Fersen, Theresa Graham as her young son, Alexandra West as false friend Yolande de Polignac, Caitie L. Moss as true friend Therese de Lamballe, Ian Alexander Erbe as a talking sheep, and David Graham as a group of revolutionaries. MARIE ANTOINETTE is presented by special arrangement with Samuel French, Inc., and is produced in part by Stuart & Peggy Bonnington and John & Cathy Stanton. Performances run April 12 through April 27 on Thursdays at 7:00pm and Fridays and Saturdays at 8:00pm, with a 2:00pm matinee on Saturday, April 20. Tickets are $25 (adults) and $15 (ages 13 and under) and may be reserved online via the below button, by phone at (931) 645-7699, or at the theatre during regular box office hours (9:00am to 2:00pm, Monday through Friday, and one hour prior to curtain). Military, APSU students and CitySaver coupon holders can receive two tickets for the price of one to Thursday performances during the run. Next post: Join us for the Unveiling of SEASON 37: Experience a New Story!